The following letter was sent to the Herald-Mail during the 2014 election. It is being re-posted in light of the fact that the City of Hagerstown has held over 40 official "closed door" meetings, as pointed out by the Facebook page "Hagerstown 1st". There has been much recent discussion and debate regarding transparency, secret meetings, and backroom deals and politics within this community. Most of this discussion has focused on WCPS, and the current Board of Education elections. I feel that we need to expand this discussion beyond its current scope. I am extremely concerned about the presence of County Commissioner Terry Baker at the “secret meeting” with Mrs. Williams, Mrs. Harshman, Mr. Guessford, and Mr. Stouffer. Mr. Baker specifically stated "I'm a county elected official. I have no say in what happens (in school system personnel matters)." Residents should question then - if Mr. Baker has no say in those matters, why was he present? What was his role in this meeting? This brings another question to light - how many other “secret meetings” have there been between our elected officials? Are other local elected officials meeting in secret as well? The Maryland Open Meetings Act requires specific circumstances for a “closed meeting”, but also requires certain disclosures regarding that meeting. By claiming an “unofficial” meeting such as this one does not apply, you are defeating the spirit of the law with the letter of the law. I have a challenge for our elected officials. Comply with the spirit of the law. If you participated in, or have knowledge of a backroom meeting, come forward and tell the public when it happened and what was discussed. Even if this meeting did not qualify as “official”, if local issues were discussed, then it’s time for full disclosure. As long as backroom meetings are conducted, county residents will never be able to trust that our elected officials have our best interests at heart. 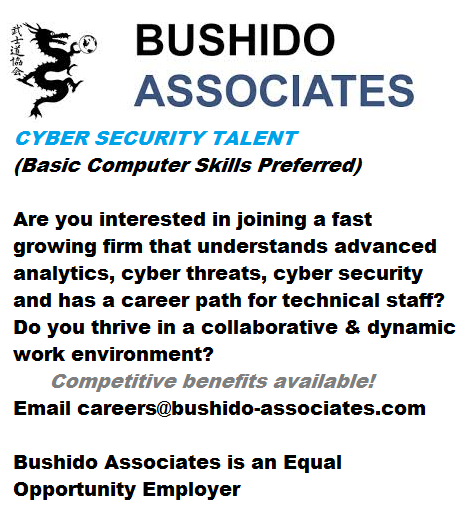 Are you interested in joining a fast growing firm that understands advanced analytics, cyber threats, cyber security and has a career path for technical staff? Do you thrive in a collaborative & dynamic work environment?